Dog Harnesses Super Original – Handmade Unique Designs! (2) - Superpipapo: In Style with Your Pet! 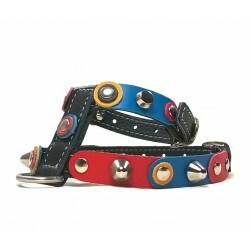 This Unique Sporty Small Studded FC Barcelona Barça Dog Harness is sturdy and beams energy. Simple in design but it reaches its goal and scores! This robust cool design Dog Harness with leather patches, olive wooden discs and rivets has a robust different look. Your dog will simply look cool! This original fashionable dog harness has beautiful blue and green pastel colored leather patches, golden stars and Polaris stones. An elegant but also happy design! 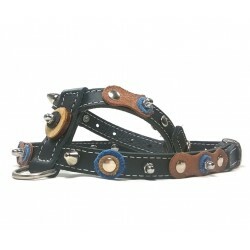 This Exclusive leather dog harness in black, red, white and blue colors is not just for Dutch dogs. It is simply very original for almost all! 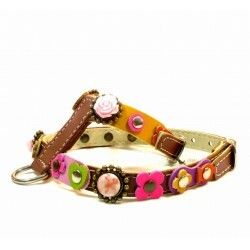 This harness for Chihuahuas and small dogs is Decorated with pretty pink and fuchsia leather patches and rivets. 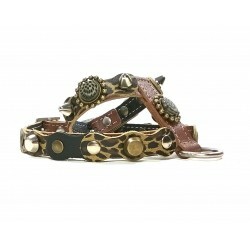 Exclusive Designer Leather Dog Harness with Swarovski Stones. For this luxurious, exclusive harness design for small dogs or Chihuahuas , shiny Polaris elements and Swarovski stones have been used. A stunning Design! Beautiful vintage style leather harness for small dogs with jewelry ornaments combined with leather flowers, hearts and beautiful pink roses. 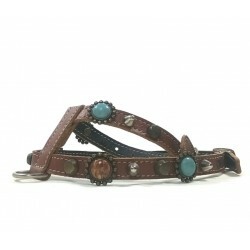 This unique leather harness for Chihuahuas and Xtra Small dogs has a stylish design with beautiful nature and turquoise stones Polaris. An unusual Design. With this Designer Handmade Leather Chihuahua studded harness and Leopard style Polaris stones , your Chihuahua or Little Dog Cool and Trendy looking! 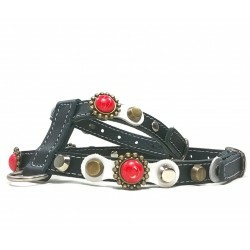 With this Designer Handmade Leather studded harness for small dogs with red Polaris coral style stones your dog is cool and looking trendy! 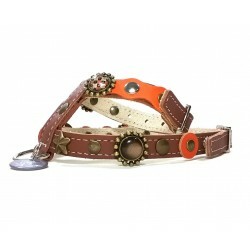 Luxury orange and brown leather harness for small dogs and Chihuahuas with originals Polaris stones and ornaments: A striking Total! 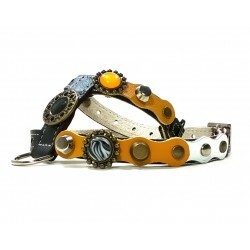 Luxury yellow and Black Leather Harness for small Dogs and Chihuahuas with originals Polaris stones and ornaments. Original and Powerfull: Is Your Dog Courageous? An original harness with beautiful red roses in ornaments and green leather leaves on black leather. Your dog will be famous with this design!